This gentle little bird takes its name from its clearly spoken call note, chick-a-dee-dee-dee. With the coming of spring it also whistles a high-pitched fee-bee. 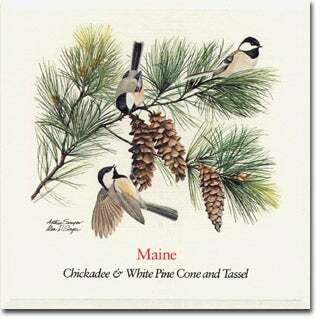 Chickadees are year-round residents in Maine. They rove the winter woodlands in small flocks, examining bark, twigs, and branches for spider eggs, cocoons, and other dormant insect life. This Chickadee can easily be distinguished from the other, small birds. Their white cheeks shine out, separating the solid black cap above from the fringed black bib below. The White Pine Cone and Tassel grows on the White Pine, a beautiful evergreen tree which grows rapidly and sometimes reaches a height of two hundred feet. Through centuries of evolution, the White Pine's leaves have changed to three-sided needles. 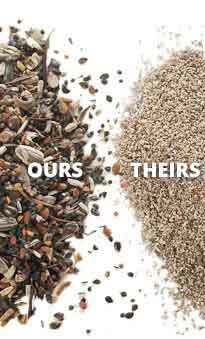 The strongest of winds cannot harm them. In fact, wind is necessary to pines and to many other trees, for it scatters pollen grains. The White Pine Cone lacks the lovely color and the sheer beauty of some flowers. Yet, the White Pine Cone and Tassel magnificently reflects Maine's stern climate, her rugged soil, and her independent people. Maine Wildflower - Twinflower. 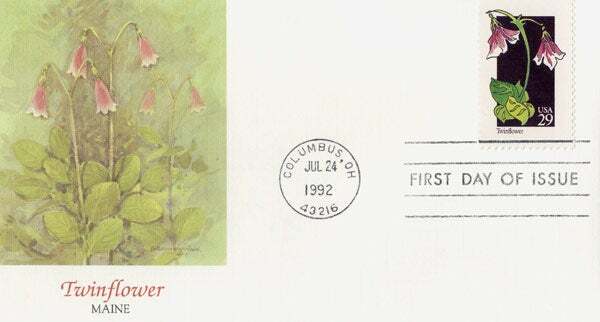 Art from the 50-stamp series, State Birds and Flowers, issued April 14, 1982 simultaneously in all state capitals.